Since this is our first blog post, I feel as though it's fitting to share a little bit about what's going on in the life of Cambridge Row and our family. This past spring has been filled with many exciting projects that we can't wait to share with you. My favorite part is that every project is so different: a wedding venue, a local jewelry showroom, several major kitchen renovations, an entire home renovation, a new construction concept, and more! It is so humbling each time our phone rings with another potential project. We're grateful for the opportunities we've had in our first year of business and look forward to what's ahead. The reason for this blog is to tell you the stories of each space: how it was once used, the potential we saw in it, and what it has become. We look forward to the storytelling aspect of interior design, because these projects don't happen overnight, either. They take time, special planning, and the ability to "see" something that does not yet exist. On a personal note, Bryan and I are attempting to bring our own home up to date, but we're realizing that "DIY" doesn't happen overnight. Instead, it happens over, well, six months and counting! To be honest, I still have several paint color samples on our bathroom walls from the day we moved in. This past week, Bryan lovingly spent hours ripping the carpet from our stairs and giving it a new, fresh look. Photos coming soon! Our puppy, Pippin, really likes the idea of helping with said projects by eating paintbrushes. On to what this post is actually about: a dramatic renovation! A dear woman I know, Kathy, kindly introduced us to one of her coworkers who moved to the area in February. After realizing that we both moved from the Washington, DC area recently, I felt an immediate connection. I just love this family, and their dogs, too! It is so special when a renovation project turns into a friendship. A before picture of the kitchen. The rest of the home was already beautifully updated before they moved in, but the kitchen needed some work. You can't see it here, but the refrigerator is to the right and there isn't much space between it and the island. Pardon my purse and measuring tape! This picture is to show how tight it was between the island and the refrigerator. Its placement made the whole room feel very closed in, so we took the whole wall away (scroll down to see more). "BEFORE" This is where you'll see the refrigerator and upper cabinets in the "AFTER"
We met together to discuss ideas, styles, and strategies for transforming the space into one that had a character of its own. The minute we arrived, it was clear at least one change needed to happen: access to the kitchen. When entering the home, guests veer to the right and approach a pretty dining/seating room. The existing kitchen was peeking through a tiny, 36" opening. It needed some "oomph", you know what I mean. That small entry became a larger cased opening with views into the kitchen. "Before" Dining Room Area Looking Into Kitchen. The fridge was behind this wall before we knocked the wall out and made it a cased opening. It is now where the double ovens are shown in the image. This plan shows our proposed changes to the existing layout. We widened the island, created a cased opening into the dining room, and relocated the refrigerator. Below is an image of what the space looks like now that we opened it and made a large entryway. It added more interesting views and better daylight. That's what we call a win-win! "After": The opening was extended to provide views into the new kitchen. Our main goal was to create something more functional and beautiful at the same time. 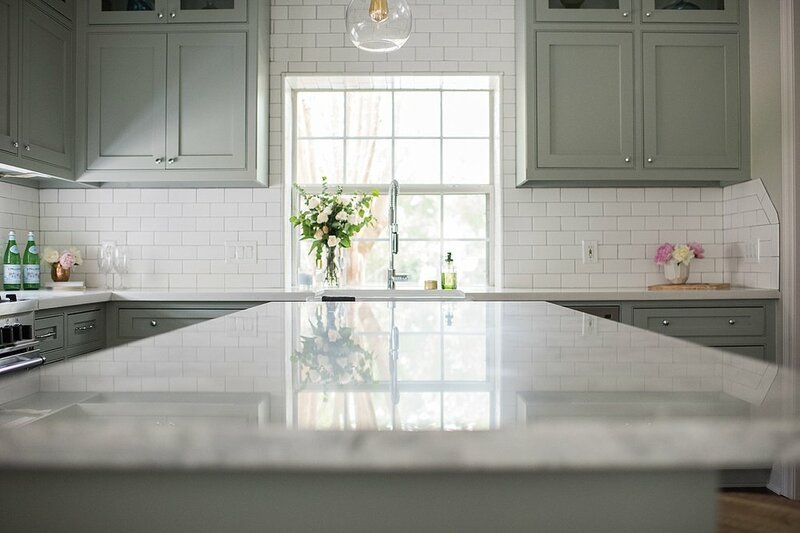 The couple loved the idea of a light, neutral kitchen but didn't want it to be too "gray" since gray paint covers most of the walls in their home. We went with a green color that still feels neutral. They seemed to love the combination of some classic and some modern elements. You'll notice this throughout the space with the subway tile, the industrial lighting, the polished chrome hardware/stainless appliances, and the soft, soothing colors. I love blending old and new together and feel it truly makes a space have character. Industrial Lighting. Photography by the amazing Melissa Parsons. View of the farmhouse sink & quartzite island. In the picture above you might be able to notice a slight variation between the perimeter counters and the island counters. The perimeter is a Caesarstone Quartz while the island is Super White Quarzite. Though the picture on their website shows a yellow tint, it's a nice, soft white in person. This complemented the gray & white quartzite nicely! Fun Fact: We went to Israel last August and happened to pass the Caesarstone manufacturing center where quartz is made. It's in a very unexpected place (almost adjacent to ancient ruins of Caesarea). If I had known, I would have asked to take a tour! 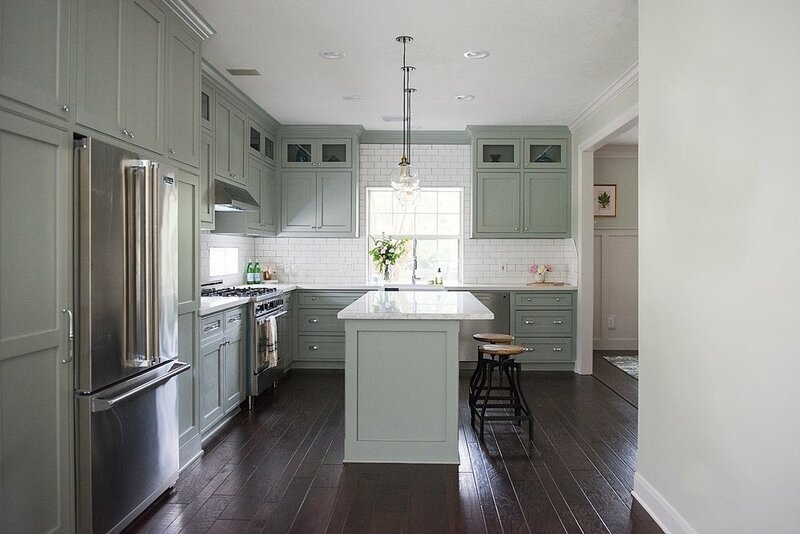 Here are a few images of other kitchen details: inset cabinets, subway tile, and more. The kitchen from the perspective of a child. The microwave is built into the island. Our amazing contractor, Rodney Tesch crafted such amazing cabinets! Inset Cabinets & Farmhouse Sink with a Polished Chrome Faucet. Here's the new refrigerator. Also, in this picture you'll notice that we took the cabinets all the way up to the ceiling to add more storage. That's a wrap! Thank you for reading!